Easily add comments, observations or any other text to tell a story, or call out important information. Add text where you want, and write it in the context of the report. 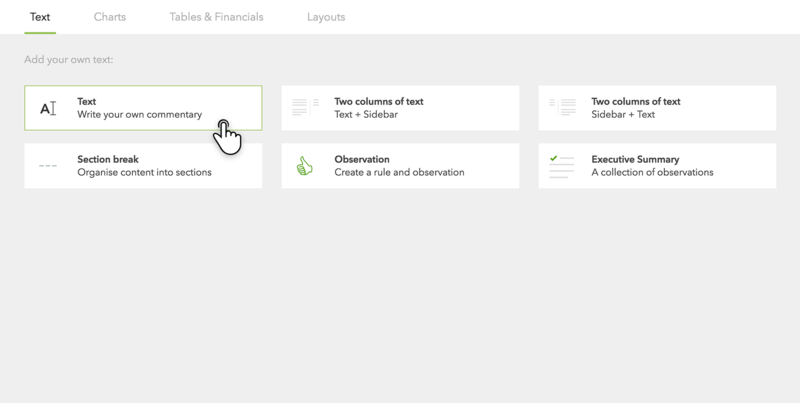 You can begin a new report with text by simply starting to type. Within an existing report, you can easily add in text by hovering between components or at the end of the report and clicking the ‘+’ button, and selecting ‘Text’ under the ‘Text’ category in the content library. Clicking inside the text box will allow you to edit the text directly. You can add emphasis and clarity to your writing through formatting, with bolding, italics, bullet points and numbered lists. For headings, a pre-formatted “title” option is also available. To resize a block of text, hover over the text block and click the three dots to bring up some additional options. Available widths are 33%, 50%, 66% or 100% (of the width of the report page). If you wish to delete a block, hover over the text block and click the three dots and select to delete the block. You can also select to “replace” the block and insert another chart in its place. 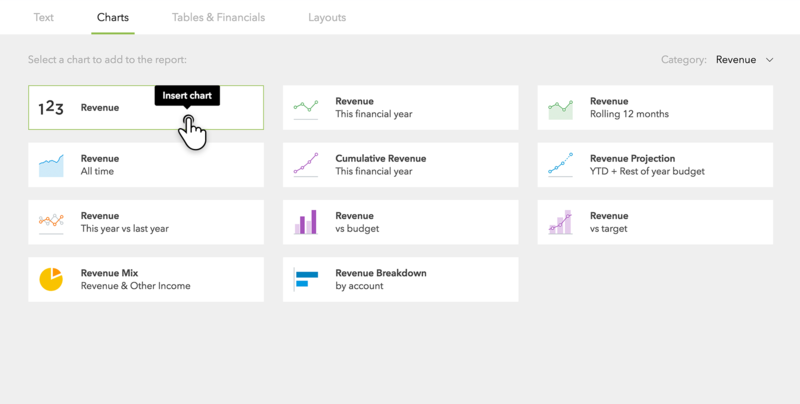 Placeholders allow you to add rich text to your reports that references your financial data. These placeholders will update if you choose to reuse this report, for a different period (a placeholder for ‘this month’ will show the current report’s month). Add a placeholder within a block of text, by typing the '@' symbol where you’d like to insert the rich text. For example, you could type "revenue growth for this month is @" and then select appropriately. What variables can be added to placeholder? You can select any KPI, any item from the P&L or Balance Sheet, or any item from the source Chart of Accounts for the company. Easily edit a placeholder by clicking on it, and changing the metric using the variable selector. Observations allow you to create conditional, rule-based commentary. They serve to efficiently deliver tailored commentary with a report. Observations allow for the flexibility of different explanations, comments, or advice depending on the result of a given metric. You can bring in an observation anywhere within the report by clicking the ‘+’ button in an empty space. Under the ‘Text’ category in the content library, select ‘Observation’. 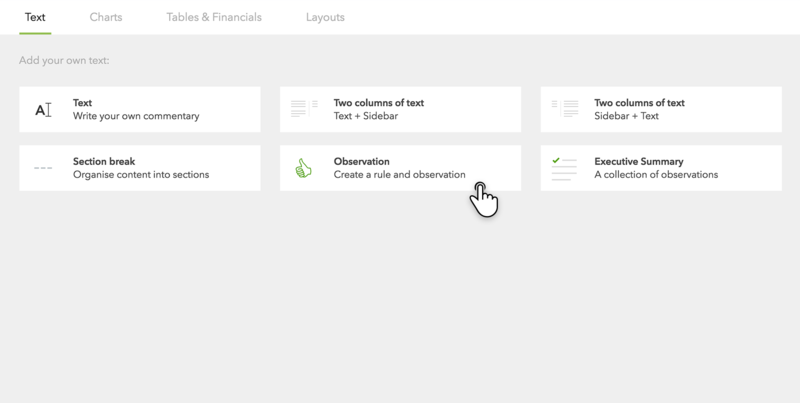 Hover over an observation and click the ‘Edit’ option to bring up the properties panel. After the “If”, you can select the key metric you would like to see by clicking on the currently selected one and entering the variable selector. Under the drop-down menu, you can select the appropriate conditional formatting. The ‘Extra condition’ at the bottom allows you to hide the observation under specific circumstances. For instance, you could choose not to show a metric if it is greater than (or less than) a certain level. How do you delete an observation? If you wish to delete an observation, just hover over it and move your cursor to the icon on the far right. An option to ‘delete row’ will appear. A “key number” allows you to highlight any KPI, item from the P&L or Balance Sheet, or any account. Key numbers are useful for seeing important metrics such as Gross Profit Margin, Total Revenue or Total Expenses at a glance. Add a key number by clicking the ‘+’ icon in a Draft report. Key numbers are found in multiple categories in the content library. They can be recognised by the "1,2,3" icon in the content library. To edit a key number, hover over it and click the ‘edit’ button. Then, from the top of the properties panel, click on the primary metric to change to another in the variable selector. Key numbers can include additional information as well. A comparative can be selected for quick variance analysis. This will display a trend (in dollars, or as a percentage) against the prior period, the same period in the prior year, or against target underneath the key number. Adding a sparkline will generate a small trend underneath the key number, showing its average performance. This is useful to get a sense of whether a metric is trending positively, or negatively over time. You can also choose to show a description of the key number. On a portrait page, the default width of a key number is 33%. This means it’s possible to fit 3 key numbers side-by-side across a page. When placed on a landscape page, you can fit 4 key numbers side-by-side.